Founder Guinness McFadden has been growing grapes organically for over 40 years. Back when he started McFadden Vineyard, organic farming had a different name: farming. It is the quality of the grapes that puts McFadden ahead of other growers. Having experimented, McFadden has established blocks, or separate growing environments for different grapes in the vineyards. Head pruned and trellised, as well as irrigated and dry farmed, these vines are planted next to the Russian River and on rocky hillside slopes. The grapes of McFadden Farm are not grown one way, but are instead thoughtful and dynamic expressions of Terroir, the marriage of grape to place, grown for desired varietal correctness. He planted his Blue Quail vineyard on a beautiful piece of land that straddles the Russian River, neighbors the Mendocino National Forest and sits up at 1,200 feet in altitude. Temperatures regularly plummet 40-45 degrees each night, allowing a longer maturation period. In this climate, grapes develop a fullness of flavor that is balanced by a crisp acidity. 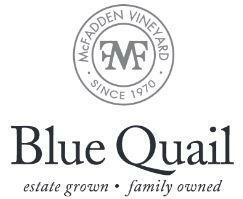 Blue quail's wines are stainless steel fermented and held with zero malolactic fermentation. There are few other wines in the marketplace, even at twice the price, where the varietal correctness, sense of place, and ease of drinkability is as evident as in the wines of Blue Quail. Across the board, what defines the Blue Quail style is a fruit forward, friendly drinkability. Their wines pair with more foods than most others and escape from being out of balance, being too much anything or having too many barriers thrown in your way by winemaking manipulations to limit enjoyment.